If you have never had a grilled peanut butter and jelly sandwich you are missing out! It is seriously so good! This is one of my all time favorite foods. It is also one of my ultimate go to comfort foods. Or I should say it used to be. Six years ago my oldest daughter developed a severe peanut and tree nut allergy. Peanut butter was eliminated from our diet and house. Which means my favorite sandwich was no longer allowed. However, when I visited my parents and my oldest daughter only stayed for part of the trip, the peanuts and tree nuts came out just about the minute she left. Yes, they did. 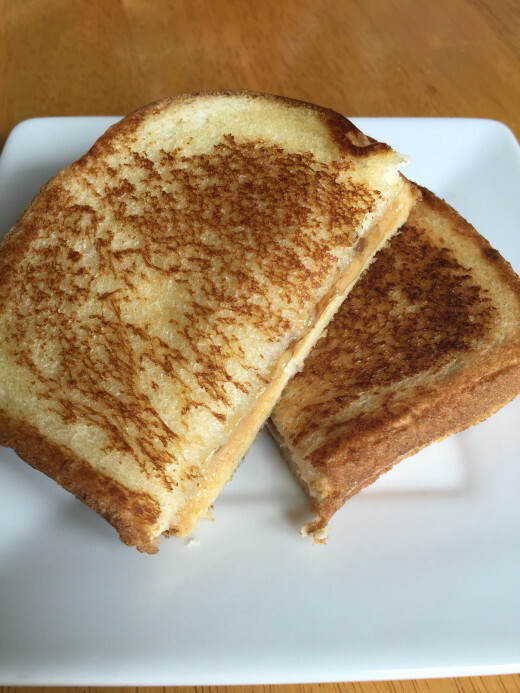 One day when we were having a quick and easy, fend for yourself, type of meal at my parents, I decided that I needed a grilled peanut butter and jelly sandwich. I had not had one in a long time and knew it was the perfect meal for me. My son didn’t remember ever having one, so I made him one as well. It was as delicious as I remembered! The peanut butter and jelly are warm and gooey and so very good! It is your basic peanut butter and jelly taken to a whole different level. I have to give credit to my best friend’s family for introducing me to grilled peanut butter and jelly. My parents and sisters think it is a bit odd. It is not something we grew up eating. However, it was a favorite in my best friend’s family. During my teen years I think I spent more time at my best friend’s house than I did my own. I grew up with three sisters and no brothers, but her younger brothers pretty much became my brothers and I kind of became part of their family for a few years. One of the sandwiches my best friend’s mom made often was grilled PB and J sandwiches. I am not sure where they got the idea, but I am pretty sure she made them as a way to change up your basic peanut butter and jelly sandwich. Peanut butter and jelly sandwiches are quick, easy, and inexpensive to make, but sometimes you get tired of them. Grilling them is an easy way to change them up for something a little different. This isn’t really much of a recipe. I almost didn’t share this sandwich because I think most of you know how to make a peanut butter and jelly sandwich. And I am pretty sure most of you know how to make a grilled sandwich. But I thought there might be a few of you that have never made a grilled peanut butter and jelly sandwich. If you are one of those people that have never tried it, you need to. Seriously you need to. If you love peanut butter and jelly you need to try grilled peanut butter and jelly. It takes a basic peanut butter and jelly sandwich to the next level. Make a peanut butter and jelly sandwich. Butter the outside of the pieces of bread. Place on a hot griddle or pan. Cook for 3-4 minutes or until browned. Flip sandwich over and cook the other side until bread is browned and peanut butter and jelly is heated through. I hope you enjoy them. I love sharing quick and easy recipes with others so I am glad you enjoy them. The sandwich sounds good. I’ll have to try it. Something I make is a peanut butter quesadilla. I just take two corn tortillas and spread peanut butter on one. Top with other tortilla. Cook in a dry frying pan until brown one one side, flip it over. Cook the other side until brown. The first time I made it I thought it was weird but now I like it. You could put some jelly in the middle with the peanut butter before you cook it or a few chocolate chips. But I like it with just peanut butter. I have friend that make pb&j quesadillas, but I have never tried it. I need to do though because it sounds good. Thanks for the reminder about them. And the chocolate added sounds really good! Absolutely live this creative idea! Can’t wait to try it. I hope you enjoy it! 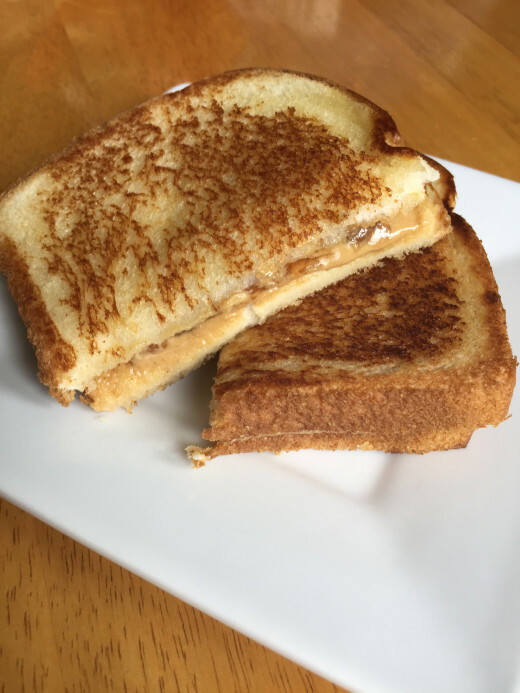 It is a fun way to change up a simple pb and j sandwich. We like grilled PB&J over here. One of my boys made a grilled Nutella and strawberries sandwich on a whim one day. It was a dangerous discovery. Grilled Nutella and strawberries sounds delicious! I am going to have to try that one!